Here's another price cut as Peter Thompson and Michael White at Ocean Independence send news of a €550,000 price drop on their joint listing, the 39.01m motor yacht Moonmaiden II. She was custom built in Turkey by the Denizcilik yard in 1974 with a steel hull and superstructure. This superyacht has an unusual accommodation configuration of five double-bedded suites for 10 guests and twin 600hp Deutz engines give her a cruising speed of 10 knots and a range of up to 3,500 nautical miles. 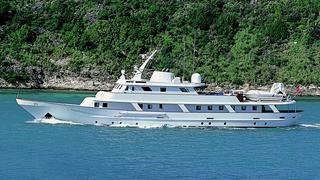 Significant repairs were made to the steelwork in 2008 and Moonmaiden II is suited for either charter or private use. Her price is now down from €2.5 million to €1.95 million.